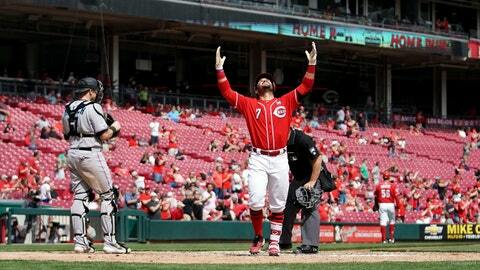 Cincinnati Reds third baseman Eugenio Suarez (7) reacts to hitting a home run against the Miami Marlins in the eighth inning at Great American Ball Park. CINCINNATI (AP) — For two days, Yasiel Puig sat and watched the Reds finally emerge from their deep slump. He felt pressure to do something important in his first game back. Puig returned from a two-game suspension and doubled home a pair of runs, helping Cincinnati complete a reinvigorating three-game sweep of the Miami Marlins with a 5-0 victory on Thursday. The Reds entered the series with eight straight losses and the worst record in the NL. They came away with their first three-game sweep of the Marlins at Great American Ball Park since 2010. Puig watched the Reds play better without him while taking the first two games of the series. Most of the 11,192 fans were chanting Puig’s name after he ran into the outfield wall unsuccessfully trying to grab a foul in the first inning, and again in the fifth when his double off Pablo Lopez (1-2) put the Reds up 4-0. He also got his first stolen base. Puig missed the first two games of the series as punishment for his role in an on-field confrontation with the Pirates at PNC Park on Sunday. Eugenio Suarez had three hits, including a solo homer , as the Reds got the better of a matchup two of the NL’s worst offenses. The Marlins have scored the fewest runs in the league (34). The Reds came in with the worst batting average (.194) despite a 14-0 win in the second game of the series. Cincinnati scored 21 runs while sweeping the series, matching its total for the first nine games. Miami managed only 12 hits and one run in the series. On Thursday, the Marlins got only one runner into scoring position. Robert Stephenson (1-0) got the victory in relief of starter Sonny Gray, who finally got a run but still couldn’t get a win because of an injury. Gray grew up a Reds fan and attended his first major league game at Great American. The Reds obtained Gray in a trade with the Yankees after he agreed to a deal adding $30.5 million from 2020-22. Cincinnati was blanked 5-0 and 2-0 in his first two starts. Miguel Rojas‘ line drive hit Gray on the left calf in the second inning. Gray limped around the mound, threw a few practice pitches, and stayed in the game for two more innings before leaving. It’s unclear whether he’ll have to miss a start. Joey Votto had a pair of opposite-field singles against an infield shift that figured in both of Cincinnati’s rallies, including an RBI in the fifth. Marlins: Catcher Jorge Alfaro won’t change how he sets up behind the plate to avoid being hit. He was conked in the head in each of the first two games of the series by batters’ follow-through on a swing, leaving him momentarily stunned. “I like to be close to the plate,” he said Thursday. Reds: Outfielder Phillip Ervin will be Cincinnati’s extra player for a two-game series in Mexico against the Cardinals. Teams are allowed to bring an additional position player for the series. Miami’s Lewis Brinson struck out in the second and was called for interference, resulting in a double play. Brinson stepped on the plate after his swing, interfering with catcher Curt Casali‘s throw to second base as Miguel Rojas tried to steal. Rojas was called out, too. Brinson fanned four times on Wednesday night and two more times on Thursday. Lopez allowed only four singles over the first four innings. The Reds put together a walk, Votto’s RBI single and Puig’s two-run double, all with two outs in the fifth. Marlins: Sandy Alcantara (1-0) faces Philadelphia’s Jake Arrieta (1-1) as Miami begins a nine-game homestand. Reds: Have a day off in Monterrey before playing the Cardinals at Estadio de Beisbol Monterrey on Saturday. Tanner Roark (0-0) will oppose Adam Wainwright (1-0).